Veterans disability payments have skyrocketed since 2000, up 170 percent to $54 billion in 2013. Not surprisingly, Capitol Hill has taken notice and rumblings are beginning about how to decrease the amount of veterans disability payments to veterans. The non-partisan Congressional Budget Office weighed in on August 7 with a report, “Veterans’ Disability Compensation: Trends and Policy Options,” and some of their presented options would be controversial and adversely impact veterans. How controversial? Like taxing veterans disability payments. Like not allowing military retirees to collect their pensions and disability payments at the same time. Like placing a time limit on a veteran’s ability to file for disability payments. The CBO estimates these changes would save hundreds of billions of dollars over the next decade. 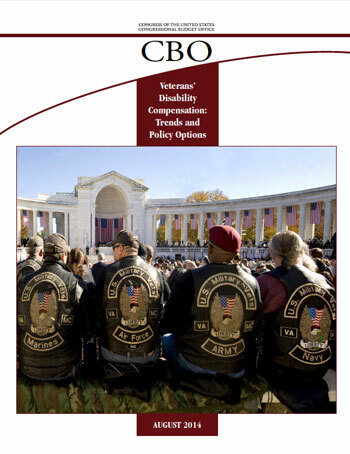 Click to download the CBO report on veterans disability payments. • The $54 billion in disability payments represents roughly 70 percent of the Veterans Benefits Administration’s total mandatory spending. • Between 2000 and 2013, the total population of living veterans declined 17 percent, from 27 million to 22 million. • During that same period, the number of veterans receiving disability payments rose nearly 55 percent, from 2.3 million to 3.5 million.• In 2013, 16 percent of all veterans received disability payments, up from 9 percent in 2000. • The annualized disability payment rose nearly 60 percent in 2013 to $12,900, up from $8,100 in 2000. Neither the VA nor Congress has weighed in on the report, but veterans should expect to hear more about this issue in the coming months. • Policy changes in the Veterans Claim Assistance Act of 2000 and the Veterans’ Benefits Improvement Act of 2008 that require the VA help veterans apply for disability benefits and assist veterans with substantiating claims. • Better outreach through increase use of the Internet (while this has arguably helped, a recent survey found that half of Gulf War-era veterans have a disability for which they have not filed a claim). • A predischarge program for current active duty personnel that allows them to submit applications before discharge. • A policy change allowing more conditions to be linked to Agent Orange presumptive status. 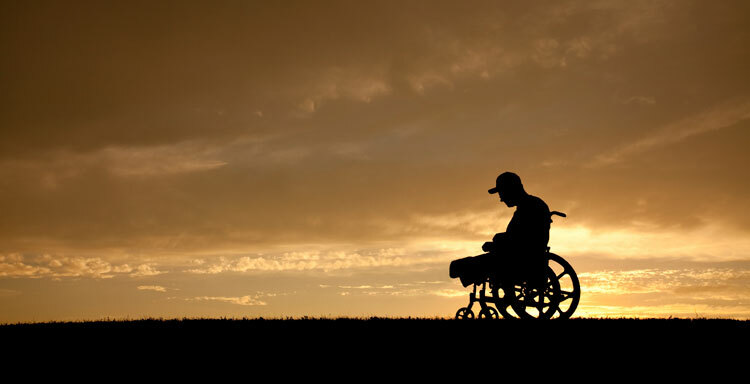 • The recent recession and unemployment led veterans to file for disability benefits to replace lost earnings. 1. Place a time limit on a veteran’s ability to file an initial application. Veterans would be required to file for any initial disability claims within a fixed period of time. The CBO looked at five, 10 and 20 years as options for filing deadlines, and the CBO says this option would not limit an application period for a veteran filing for a presumptive disease or condition. Also, veterans receiving disability benefits would be able to request re-evaluation if their conditions worsened, or if new conditions developed. Projected savings: Between $9 billion and $28 billion. 2. Require the VA to expand its use of re-examinations. This requirement would have the VA re-examining temporary ratings for veterans over the age of 55 (which it currently does not do), veterans whose conditions have lasted for five years or longer, and veterans who are receiving the minimum benefits for their conditions. The CBO says that medical and technological advances means the VA should be taking a wider second look at veterans disability payments. Projected savings: Not determined. 3. Change the standard for declaring presumptive conditions. This option would mandate the VA consider “additional scientific criteria”, not just the positive association of exposure to a hazard and the onset of a disease or condition. These additional criteria for declaring presumptive conditions would be risk factors individual to the veteran: diet and aging, personal habits such as smoking, other environmental factors after military service as ended. Projected savings: Not determined. 1. Restrict individual unemployability benefits to veterans who are younger than full Social Security retirement age. The VA would no longer make individual unemployability payments to veterans who had reached the full Social Security retirement age, either 65 or 67, depending on the veteran’s birth year. Any VA payments past that age would revert to the amount associated with the veteran’s disability rating. Projected savings: Up to $17 billion. 2. Change the cost-of-living adjustment. This option changes the standard that would keep veterans disability payments in line with inflation, to an index for all urban consumers that grows more slowly than the current index in use. Projected savings: Between $10 billion. The CBO argues changing the 2003 policy that allowed military servicemembers who retired with 20 years or more service to receive both their full retirement annuity and VA disability compensation. This option would revert to pre-2003 policy, which means that military retirees had to choose between their retirement annuity or VA compensation, having their retirement annuity reduced by the amount of their disability compensation. According to the CBO, “Because the DoD retirement annuity for longevity is generally taxable, whereas the VA disability compensation is nontaxable, most retirees in that situation chose to keep their VA benefits and forgo part of the DoD annuity.” Projected savings: $119 billion. 4. Tax VA disability payments. The CBO argues that the current system does not account for differences in an individual veteran’s “education, training, occupation, or motivation to work.” The CBO says taxing disability payments would mean that veterans who have higher income would see less after-tax compensation, but those veterans would have “smaller losses in earnings as a result of their disabilities than lower-income veterans with similar disability ratings.” Projected savings: $64 billion. What do you think about the CBO’s options to Congress on veterans disability payments? How would they change your standard of living or quality of life? You can read more about CBO report here.